The aim of the network entitled “Dritte Generation Ostdeutschland” (Third Generation of East Germany Network) is to provide the “children of German reunification” with a voice. The network’s co-founder, Adriana Lettrari, explains in this interview why this is still necessary 25 years after the fall of the Wall and what her generation can do for society. Ms Lettrari, what exactly is the Dritte Generation Ostdeutschland? The generation we are talking about comprises all those people born in the years between 1975 and 1985, more than 2.4 million people. These “Wendekinder” (children of German reunification) were born in the former GDR and grew up in a reunified Germany. Our network does not speak for the whole generation, but serves more as an umbrella organisation under which they can exchange their ideas and experiences, as well as make plans for the future. We want to significantly participate in determining the direction of social discourse and we have published a book in which 30 of the generation’s authors have been given a voice. Many of these “Wendekinder” are doing exciting things and this has to be made more visible - even if it also means calling the image of the East Germans into question. Why do you think this is necessary? For quite some time I was asking myself the question why I had such an unresolved relationship with the place where I grew up. I wanted to get away. Five years ago I saw a talk show on TV, the discussion was about the GDR. The people doing the talking were almost all older, West German men. East Germans were mostly quite thin on the ground in the German media anyway. It made me furious. Whenever the talk was about us, the image conjured up was always the same: Kevin from Chemnitz, right-wing extremist, unemployed, addicted to drugs. When you think of what my generation has achieved in terms of education and mobility, it was in my opinion just not fair. Adriana Lettrari is co-founder of the Dritte Generation Ostdeutschland network. | © Ronny Keller What is so special about your generation? My impression is that we went through a double socialisation process. After the Wall came down in 1989 we adapted relatively quickly to the demands of a new economic and political system - although we had been raised by a system that was partly shaped by values that were different to those of West Germany. We are much more familiar with the subject of social responsibility, for example, than that of distinctive individualism. Should the potential of your generation be exploited more? [Adriana Lettrari is co-founder of the “Dritte Generation Ostdeutschland” network © Ronny Keller] The experience of having been sandwiched in between two worlds is incredibly useful. In biography workshops we tell others about our personal experiences. There is a great need to understand our own histories: How can I benefit from the special experience of having grown up in two different states? How did I cope with the big change? This can help us to be more confident. An East German entrepreneur once told me how he had dealt with the big change, “I lived only from day to day and every day I tried to give my best.” That may sound simple, but it was very useful. The Third Generation is ideally suited for work as a consultant for processes of change. How have your projects been received? We have already won various prizes, for example, the Gustav Heinemann Prize for outstanding contribution to civil society. The world of politics is also interested. Manuela Schwesig, the German Federal Minister of Family Affairs, is a sponsoring member and we recently had a panel discussion with Matthias Platzeck, the former Prime Minister of the state of Brandenburg. In the meantime our meetings are being attended by more and more people from our parents’ generation and from West Germany. We now have four regional networks, among others, in Switzerland and the USA. 25 years after the fall of the Wall surely the differences between East and West have long since disappeared, haven’t they? We have to come to terms with the East German part of our identity and reconcile ourselves with it. We are not trying to start a renaissance of the “Ossis” (pejorative nickname for former residents of East Germany). We want to bring forth an understanding of a new, pan-German Third Generation. That is why at this year’s big Generation Meeting - our main event - West Germans and immigrants are being invited for the first time. After all it is all of us together who will determine the future of our country. Adriana Lettrari, born in Neustrelitz in 1979, grew up in Rostock. 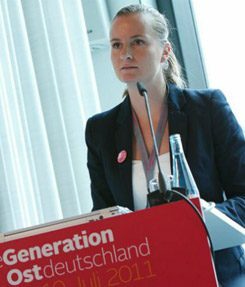 She is a graduate in political science and communication studies and has worked, among other things, as a research officer for the Bundestag (German parliament) and as an executive secretary of a parliamentary group in the regional parliament of Mecklenburg-Western Pomerania. She is the co-founder of the Dritte Generation Ostdeutschland, the network that was launched in 2010 and she is also the executive secretary of Wendekind gUG, the legislative framework for the network. Michael Hacker et al. (ed. ): Dritte Generation Ost. Wer wir sind, was wir wollen, Berlin: Ch. Links 2012. The interview was conducted by Anika Kreller. She works as a free-lance journalist in her home town of Leipzig.